Price: $25 per person using the special HSRC discount code DISC-RCAN -- that's $20 off the regular admission of $45 per ticket! "Woody Sez" was devised by David M. Lutken with Nick Corley and Darcie Deaville, Helen J. Russell, and Andy Teirss. 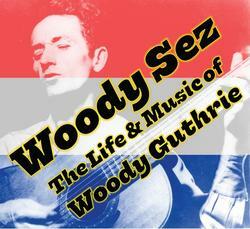 More information about the show, with performance video clips, is online at www.WoodySez.com. This specal concert is being presented by Penguin Rep Theatre. Tickets can be purchased online at www.PenguinRep.org or by calling the Penguin Rep box office, at (845) 786-2873, between 11 am and 3 pm Monday-Friday. Don't forget to use our DISC-RCAN discount code!